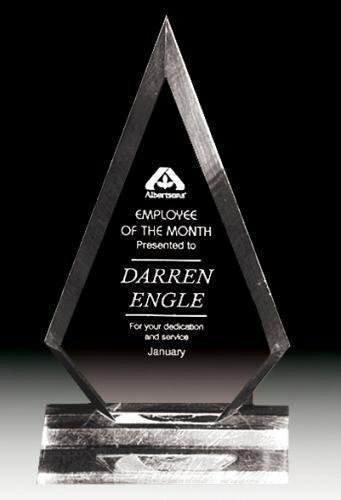 Elegant is the only term that one can use when describing these Corporate Acrylic Arrowhead Awards. An arrowhead shape with wide bevel edges enhances a large engraving or laserable area that can accommodate any of your personalization needs. Flexibility is a key component for these awards that come in your choice of three sizes 8 1/2", 9 3/4", or 10 5/8" and are available in a clear or jade finish. A white presentation box completes these fine awards that anyone would be proud to give or receive. 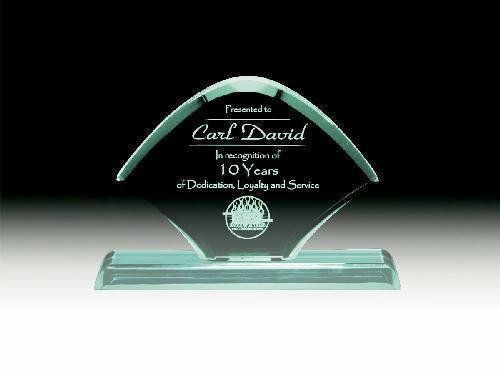 Elegant is the only term that one can use when describing these Corporate Acrylic Celebration Awards. 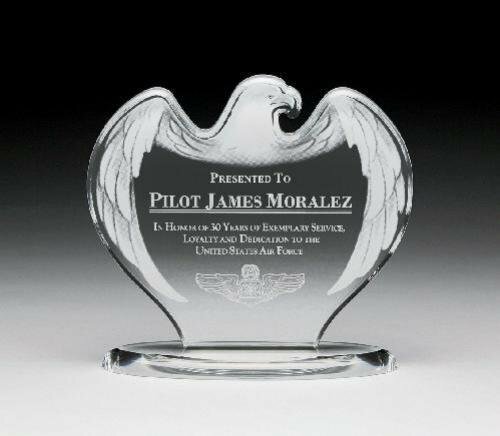 A unique shape along with a frosted design and gold stars enhance a large engraving or laserable area that can accommodate any of your personalization needs. The matching acrylic base completes the look. Flexibility is a key component for these awards that come in your choice of three sizes 6 5/8", 7 5/8" or 8 5/8" and are available in only a clear finish. A white presentation box completes these fine awards that anyone would be proud to give or receive. Elegant is the only term that one can use when describing these Corporate Acrylic Coronet Awards. A unique design that incorporates beautiful cuts to reflect light and add depth all enhance a large engraving or laserable area that can accommodate any of your personalization needs. This acrylic award sits atop a sleek black weighted base. 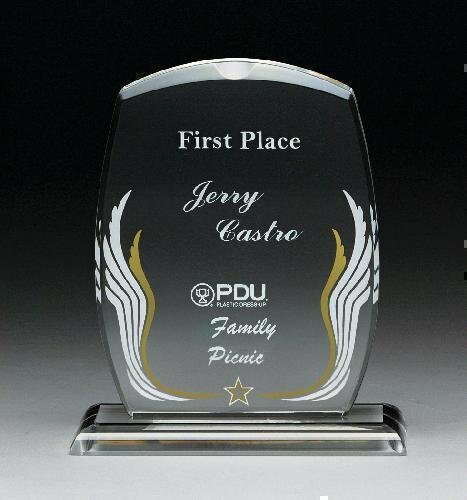 Flexibility is a key component for these awards that come in your choice of three sizes 7 3/4", 9 1/4" or 10 3/4" and are available in a clear or jade finish. A white presentation box completes these fine awards that anyone would be proud to give or receive. 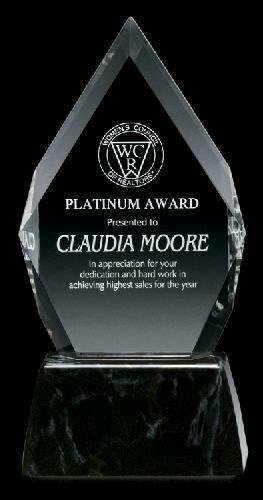 Elegant is the only term that one can use when describing these Corporate Acrylic Diamond Awards. A unique diamond design that incorporates beautiful cuts to reflect light and add depth all enhance a large engraving or laserable area that can accommodate any of your personalization needs. This acrylic award sits atop a sleek black weighted base. Flexibility is a key component for these awards that come in your choice of three sizes 7 3/4", 9 1/4" or 10 3/4" and are available in a clear or jade finish. A white presentation box completes these fine awards that anyone would be proud to give or receive. Elegant is the only term that one can use when describing these Corporate Acrylic Elegance Awards. 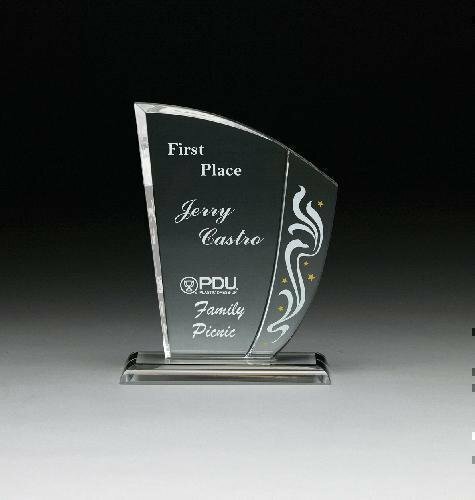 A unique shape along with a frosted design using gold highlights enhance a large engraving or laserable area that can accommodate any of your personalization needs. The matching acrylic base completes the look. Flexibility is a key component for these awards that come in your choice of three sizes 6 5/8", 7 5/8" or 8 5/8" and are available in only a clear finish. A white presentation box completes these fine awards that anyone would be proud to give or receive. Elegant is the only term that one can use when describing these Corporate Acrylic Frosted Rectangle Awards. A unique layered rectangle look with deep frosted cuts enhance a large engraving or laserable area that can accommodate any of your personalization needs. The matching acrylic base completes the look. Flexibility is a key component for these awards that come in your choice of three sizes 6 5/8", 7 5/8" or 8 5/8" and are available in a clear or jade finish. A white presentation box completes these fine awards that anyone would be proud to give or receive. Elegant is the only term that one can use when describing these Corporate Acrylic Gingko Awards. A unique broad leaf shape with rounded and cut edges that enhance a large engraving or laserable area that can accommodate any of your personalization needs. The matching acrylic base completes the look. Flexibility is a key component for these awards that come in your choice of three sizes 5" X 6", 5 5/8" X 7", or 6 5/8" X 8" and are available in a clear or jade finish. A white presentation box completes these fine awards that anyone would be proud to give or receive. Clear 5 5/8" X 7"
Jade 5 5/8" X 7"
Jade 6 5/8" X 8"
Clear 6 5/8" X 8"